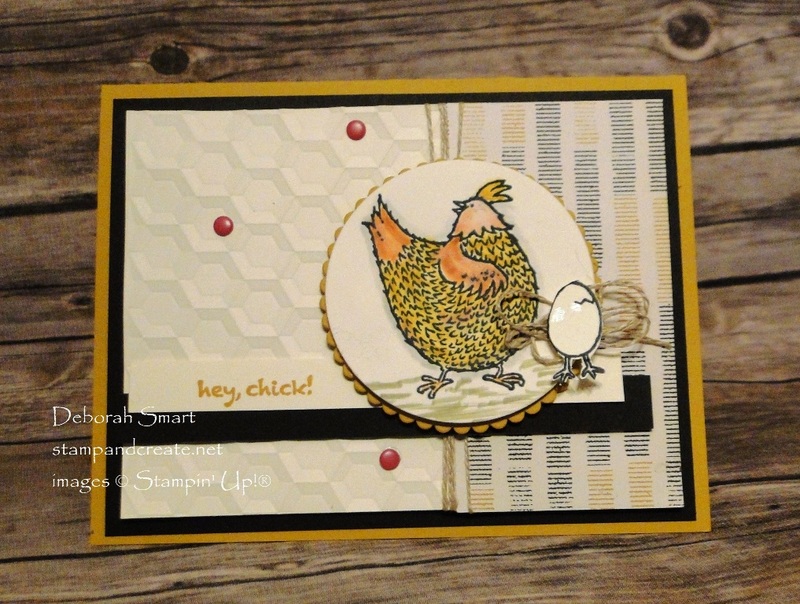 PCC235 Sketch Challenge with Hey Chick! 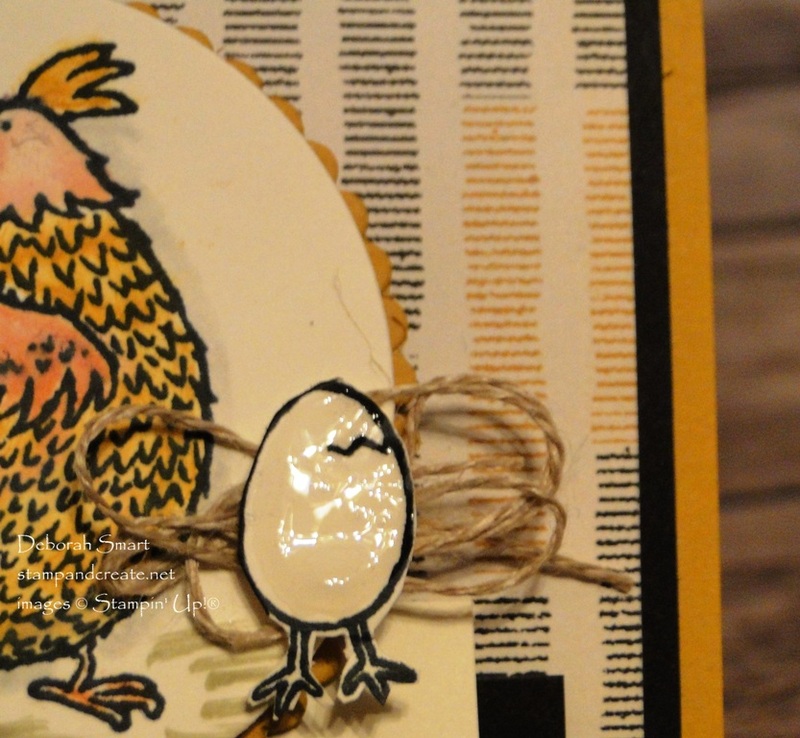 Welcome to this week’s sketch challenge with the Paper Craft Crew! I really like this sketch, but to accommodate the stamp I wanted to use, I flipped it from left to right. This Hey, Chick! stamp set from the Sale-A-Bration brochure is so cute, I think! The funny chickens with their own personalities make me smile 🙂 Did you notice that I flipped the sketch, so that the chicken was looking backwards at the sentiment? Like someone is calling to her! There’s only a couple of weeks left of Sale-A-Bration, so if you haven’t gotten this set for FREE yet – better get shopping before March 31st! I pulled the colours from the Urban Underground Designer Series Paper that I used. I like the Basic Black with the Delightful Dijon, and I added in Cajun Craze on the chicken and in the Candy Dots. The Very Vanilla cardstock is embossed using the Hexagons Dynamic Textured Impressions Embossing Folder. A tip to getting the best result with this folder is to spritz your cardstock on both sides before placing it in the folder. That way, the fibres of the paper are softened, and they accept the deep impression of the folder without tearing. To colour the chicken, I used the Delightful Dijon and Cajun Craze ink pads and a Blender Pen. By pressing the lid into the ink pad, while the lid is closed, you transfer some ink onto the lid. Then it’s easy to pick up the ink with the Blender Pen, and add layers of colour. I gave the egg it’s shiny look by applying glue with the Fine Tip Glue Pen, like I did to the Tasty Truck window in THIS POST. Previous Previous post: A Paper Pumpkin Designed by Our CEO! Great card, Deborah! I love the shiny egg and all the other little extra special touches. I”m going to miss this set.